Whether you’re in search of culture, relaxation or adventure – you can find it in Croatia’s crown jewel – Dubrovnik. Dubrovnik, with its stunning landscape and beautiful architecture, is definitely the worst kept secret in Mediterranean cruising. Dubrovnik has a fascinating cultural history and is situated on the Dalmatian Coast; one of the most beautiful coastlines in the world. Dubrovnik is a popular stop for cruise ships because there is simply so much to do. If you love visiting churches and historic sites, then you’ll be captivated by the St. Ignatius of Loyola and Dubrovnik’s medieval City Walls. However, if you prefer day-trips and lounging by the beach, then the Jewel of the Mediterranean is the city for you. Dubrovnik boasts of its own Riviera and is a fantastic stopping point for visiting the gorgeous island of Mljet. It doesn’t matter what type of holiday you prefer; there truly is something for everyone in the stunning city of Dubrovnik. In addition to Dubrovnik’s fantastic cultural heritage, it is also a wonderful holiday destination to soak in the summer sun. Dubrovnik enjoys some of the best weather in the Mediterranean and has a much-appreciated coastal breeze. 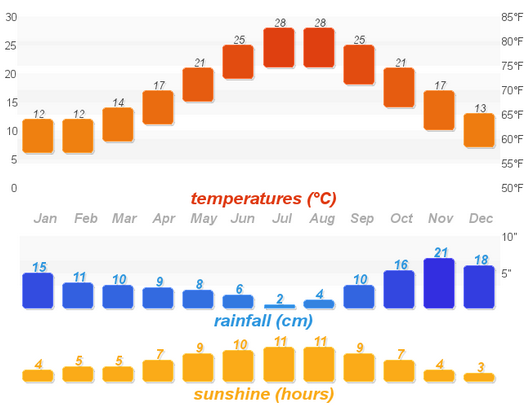 If you are looking to visit Dubrovnik when it’s not too hot, then the Spring and early Autumn months are particularly popular amongst cruisers. However, the advantage of visiting the Mediterranean on a cruiseship is being able to enjoy the cool sea breeze. However you enjoy your holiday is entirely up to you! In terms of the city itself, there is plenty to keep you occupied. Dubrovnik is dominated by the Medieval architecture and terracotta tiles of the Old Town. The city was formed in the 13th Century and retains many of its historic features, including architecture from the beautiful Gothic, Renaissance, and Baroque periods. Although Dubrovnik itself is remarkably preserved, it’s certainly endured a turbulent history. In 1667, a devastating earthquake hit the city of Dubrovnik and killed nearly 5000 people and destroyed most of the old town. In addition to this, Dubrovnik also suffered damage during the various conflicts of the 1990’s. However, with its fascinating history and unique architecture, Dubrovnik was declared a World Heritage Site by UNESCO in 1979. The Walls of Dubrovnik were first built in the 7th Century when the city was under the control of the Byzantine Empire. Today, most of the wall which survives was constructed between the 12th-17th centuries and is over 6,000 ft in length. The walls have been used as a defense mechanism for hundreds of years, most notably during the Venetian Siege (948) and the Fourth Crusader Siege (1205). 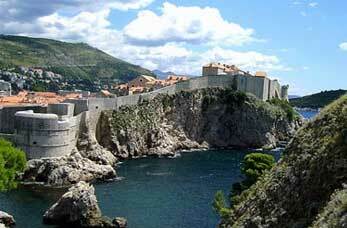 The strategic military location of Dubrovnik means that there are many fortresses along the City Wall. In the summer months (1 June – 15 September), the Walls are open between 8.00am and 7.30pm (except from 1 August – 15 September when the Walls close at 7pm). If you are travelling with young children or older people, it might be advisable to check accessibility to prevent disappointment. 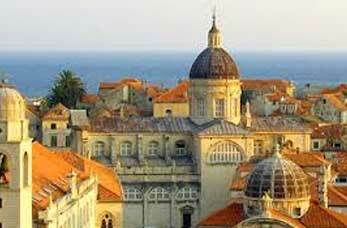 Rector’s Palace is one of the most historical sites in Dubrovnik and is definitely worth a see. It served as the palace for Dubrovnik’s Rector between the 14th and 19th centuries. Inside the palace, you can see the Rector’s offices, his private chambers, and the beautiful public halls. It was built twice, first by the Onofrio della Cava who decorated the palace in a Venetian/Gothic style. Following this, it was re-built by Michelozzo Michelozzi who added Renaissance-inspired and Baroque elements to complete the design. Today, visitors can enjoy seeing the palace’s outstanding sculptures and beautiful carved columns. 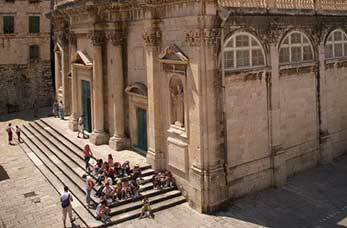 Rector’s Palace is open from 9.00am – 6.oopm from May to October. One of the great pleasures of strolling around Dubrovnik is visiting the beautiful churches and monasteries. The St. Ignatius Church is particularly worthwhile. With its striking Baroque frescoes depicting the life of St. Ignatius, the church is very popular amongst tourists and cruisers alike. 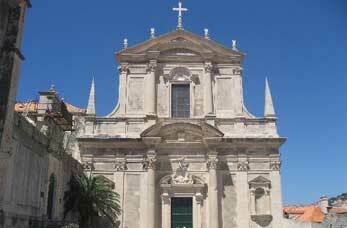 It also has a special claim to fame: the church belfry is home to the oldest bell in Dubrovnik, cast in 1355 by the craftsmen Viventius and his apprentice (and son), Viator. In addition to the Church of St. Ignatius, Dubrovnik has its own Cathedral which is absolutely breath-taking. According to legend, Richard the Lionheart was shipwrecked on the Dalmatian island of Lokrum on his return from the 1192 Crusade 1192. In order to thank god for saving his life, he vowed to build a cathedral upon where he landed onshore. After much discussion, Richard was persuaded by his leaders to build the cathedral in Dubrovnik itself. Tragically, however, the Cathedral was destroyed in the 1667 earthquake but was faithfully restored again 1981. When excavators were restoring the cathedral, they discovered another church buried in the foundations which dated to the 7th Century (the time in which Dubrovnik was allegedly founded). The current Cathedral, therefore, is a fantastic mixture of old and new architecture from its recent restoration. The Homeland War Museum was is a museum dedicated to remembering the Yugoslav Wars (1991-1999) and the subsequent Croatian War of Independence (1991-1995). The Museum is located in a Napoleonic Fort, a key military location in 1991, and is accessible to visitors by a cable car. The Homeland War Museum has many exhibitions and displays examples of ammunition, military maps, and video recordings of Dubrovnik’s bombing during the conflict. War Photo Limited is located within the historical Walls of Dubrovnik’s Old Town. It’s a particularly powerful and emotive museum and one of the most popular tourist sites for visitors. The purpose of the museum is to ‘expose the myth of war…to let people see war as it is, raw, venal, frightening, by focusing on how war inflicts injustices on innocents and combatants alike’. It has several key exhibitions and covers the events from the Bosnian, Yugoslav, and Croatian Wars. The Franciscan Monastery is a beautiful sight within the city of Dubrovnik. Although the Monastery is badly damaged in 1667, inside you can still see the 14th Century cloister (a beautiful late-Romanesque structure). The Monastery also has a special history and can boast of having the third oldest pharmacy in Europe (build in 1391). Inside the museum, there is a small but wonderful collection of relics, liturgical objects, and other artefacts. If you are a visual learner, then there is also a good selection of paintings and photographs. The museum is located in the Old Town and is open between 9.00am and 6.00pm. In addition to Dubrovnik’s churches and museums, there is plenty to do in terms of leisure. The city has some of the most beautiful beaches in the Mediterranean and is a key attraction for cruisers. The water is warm, crystal clear, and is highly regarded for bathing. There are also lots of cafes and bars nearby to suit couples and families alike. Banje Beach is located close to the harbour (as seen above) and is incredibly popular. The great thing about Dubrovnik is that you can have the best of both worlds. You can spend your mornings taking in the cultural sites and visit the beach in the afternoon. In order to avoid disappointment, it’s best to get there early because many tourists will compete for a space in the sun. If you fancy getting away from the city centre and busy beaches, then Dubrovnik also has plenty of options for day trips. 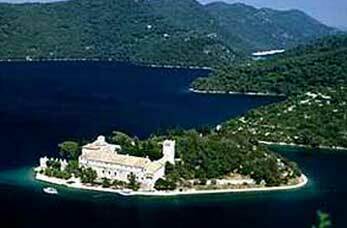 The gorgeous island of Mljet features genuinely stunning scenery. With sprawling beaches, ancient caves, and a beautiful Natural Park, there is something to keep everyone happy. Although incredibly popular amongst tourists, Kotor is a wonderful option for cruisers who love a bit of adventure. Kotor is located in Montenegro but is only 57 miles away from Dubrovnik city centre. In a similar style to Dubrovnik, Kotor is a beautiful coastal town with wonderfully uniform terracotta tiles. The city is truly ancient, having been part of the Roman province of Dalmatia and recorded as early as 168 BC. It was heavily fortified by the Byzantine Emperor Justinian and continued to be economically and culturally dominant throughout the Middle Ages. Kotor has a varied cultural history and has been occupied by the Saracens (840), the Bulgarians (1002) and even the Ottomans (1538 and 1657). There is plenty to see in Kotor and the Old Town entrance is really something to see. As a heavily fortified town, the city gates read ‘What belongs to others we don’t want, what is ours we will never surrender’. Now that’s how you make an impression. The Bay of Kotor is one of the most popular sites in the city. According to locals, the small island (shown below) was created by thousands of fishermen throwing pebbles into the sea. Allegedly, they saw a vision of Madonna and the Child on the rocks and decided to pay homage. The island, known as Our Lady of the Rocks, is strategically important and, to this day, boats cannot enter the harbour without permission from the island guard. The island features its own museum and church and comes highly recommended by tourists and cruisers alike. Dubrovnik is one of the most beautiful and highly sought after cruise destinations in the world. The success of Dubrovnik lies in its versatility and ability to offer something for everyone. It makes a fantastic stop for cruisers because there are so many cultural and leisure pursuits to enjoy. The history of Dubrovnik is really something special. Although it has endured difficult times, the perseverance of locals has ensured that Dubrovnik remains an authentic historical city. The City Walls, which dominate the skyline, are a wonderful site. In fact, they are so iconic that HBO chose to film Game of Thrones in Dubrovnik’s Old Town. It’s Dubrovnik’s ability to capture the imagination which makes it stand out from other Mediterranean cities. In terms of museums and galleries, the Dalmatian coastal city has plenty to offer. The Homeland War Museum and War Photo Limited are internationally renowned for their educational excellence. The Dubrovnik Cathedral, furthermore, is a wonderful testament to the history of the city. Although much of the original was destroyed, locals and UNESCO worked tirelessly to preserve their cultural heritage. The multi-layered, multi-cultural nature of Dubrovnik makes it a hugely popular location for tourists and cruise destinations. The location of Dubrovnik is also incredibly advantageous for day trips. The city of Kotor, located a car drive away, is a wonderful option for those who feel a little adventurous. Like Dubrovnik, this city is steeped in history and offers an alternative beyond the usual tourist routes. Dubrovnik is the city for you if you’re looking for fun, historical sights, and plenty of time in the sunshine. It really is a versatile location and continues to be incredibly popular for cruisers who travel throughout the Mediterranean.